2019-2020 Season Passes are NOW ON SALE! The most affordable skiing & riding in Vermont! Pick the days you want to receive our mountain snowfall, trail news and updates. Ski or ride all season long with NO restrictions! Plus use of cross-country & snowshoe trails, heated pool & hot tubs, the FunZone 2.0 Ozone, and outdoor skating rink. A discounted Season Pass for adults that purchase one or more Youth Season Passes. You get unrestricted skiing or riding all season long! Skiing or riding on Morse Mountain including Morse Highlands all day, every day, all season long. Morse is traditionally open from mid-December through late March. Our Winter 2019/20 Hybrid Pass, Senior Pass, Bash Badge and Bash Badge Plus products will be available in early August. Enjoy all the great benefits of a vacation at Smuggs, all Summer long! Endless activities for all ages; 8 pools, 4 waterslides, 2 mountain reservoirs, access to the FunZone 2.0 Ozone, Mountain Bike Skills Park, and so much more! The Vermonter Summer Pass is valid June 14 - September 2, 2019. For Vermont residents only. Learn more. Pass & Badge holders receive great Winter Benefits! * Click to learn more. Pass Protection Plan (PPP) For ONLY $10, Smugglers' has your back! 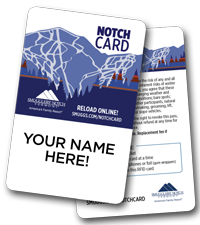 Our Pass Protection Plan (PPP) covers the pass or badge holder with up to (1) replacement Notch Card if lost, damaged or stolen. Forgot your Notch Card at home? No problem, PPP allows for up to (2) complimentary day tickets for the plan holder! Without the Pass Protection Plan, replacement fees are $5 plus tax plus a $20 processing fee. Pass and Badge purchases are non-transferable and non-refundable. Add-on the Vermonter Daycation Pass to your Winter 2019/20 Season Pass for just $109/adult & $79/youth! All Pass prices subject to 6% Vermont Sales Tax. All sales are non-refundable. All rates are in US funds and are subject to change without notice. All products are non-transferable. Benefits and discounts associated with a pass are only applicable to the pass holder. *Season Pass benefits do not apply to the Child 5 & Under.